Project 8. Does trout stocking help the wild brown trout river fisheries recover? Some recreational fishers see stocking as a logical solution to improve numbers of fish in streams where there may be low numbers. However placing fish into streams where existing populations of trout are present may not be the most appropriate action, nor achieve the desired result. 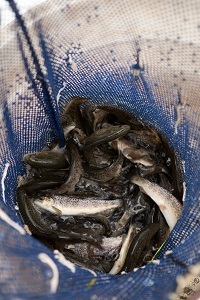 Action: Undertake brown trout stocking trial and evaluate (differentiate trout by fin-clipping, marking or tagging). How will this help? : Past fisheries research in Victoria on wild trout fisheries and on fisheries worldwide suggest that stocking on top of existing self-sustaining populations is an ineffective long-term strategy to enhance wild stocks as it provides a very low-return to anglers at considerable expense. However, anglers have a strong affinity with fish stocking and it can be seen as a fisheries management panacea (cure all). There is a case to reassess the effectiveness of fish stocking to enhance the wild trout fisheries in Victoria and to better communicate findings, educate stakeholders and re-examine the cost-effectiveness of this management option.